Cajun put the fiber optic ones on when they worked the gun over. I did find a website that claims they have some...seems to be the ones that fit the 75 Compact. I will try to get that confirmed as the site specifically says CZ 75DPCR. Due to the slide cut on the PCR, they look a little funky when installed on that gun, but they work just fine. There's an extended write up on the other forum about them on a PCR, but I'm not sure if it's kosher to link. A google search will get you right there. Thanks I’ll check That out. CZ guru website listed some but I contacted those sites directly and said none of them would work. I guess anything will work with modifications. I may end up selling the gun if I can’t find a solution that works for me. According to all major makers of sights none of these fit really well. But all is not lost. 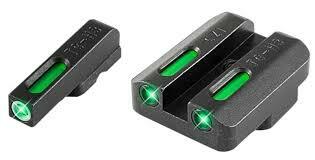 Dawson now makes a tritium sight set specifically for the CZ 75D PCR. Currently it is back ordered.